Many home parties and barbecues revolve around a fire pit. You too can have a fire pit, and it does not have to be expensive. Decide what type of fire pit you would like, and build it from things around the house. Your guests will compliment you on your ingenuity. Perhaps you have a large concrete birdbath that you do not use anymore. Use the bowl for a fire pit. Make a gravel pad several inches thick, or build a base with bricks. This step is necessary, as the pad will absorb the heat and create a barrier between the fire pit and the ground. Place the birdbath bowl on top of the bricks or gravel. Place tree limbs inside the bowl and light them. Do not place this type of fire pit on a deck. It is better suited to the lawn area. Build a base the same as above. Stack bricks or stone in a square or circle or other shape. Stack the bricks or stone approximately 2 to 3 feet high. It is not necessary to mortar them, but if you would prefer, mortar will hold them in place At this point, you have a choice of an open fire pit or a container to hold the fire. Use old barbecue pits, metal buckets cut to size or any other container that is fireproof down in the stones to contain the fire. Alternatively, use the pit as is. Make a fire ring. Fire rings are made of metal and have cutouts in the sides of the rings to create unusual shadows on the ground Use a 55-gallon metal drum and cut the bottom fourth of the drum off, leaving the bottom intact. Draw designs on the outside of the pit ring and cut them out with a welder. If you cannot do this, take it to a local welder who will do it for you You will need a gravel or brick base for this as well. Prepare the base larger than the ring, and set the ring in the middle. Your fire ring is ready to use. 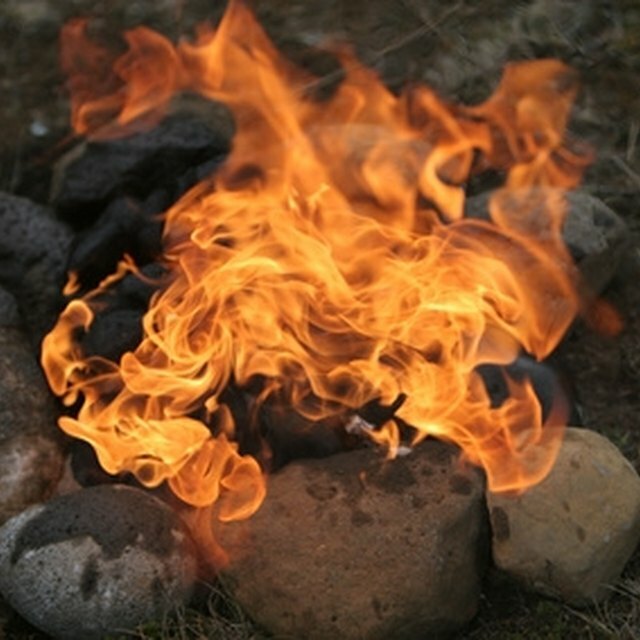 Important considerations when using a fire pit or ring in your yard include having a fire extinguisher available in case of a fire starting from stray embers. Use a window screen or fire pit screen to hold the embers and sparks inside to prevent an occasional stray fire. Do not place a fire pit under a tree or on top of exposed roots. A fire may accidentally become out of control.